approach to acrylic & oil painting. Follow along step by step as the nuts and bolts of painting are covered from start to finish. Learn to set up an impressionistic palette of bright colors and how to resolve any painting issues which arise through the process. See website for supply list. Ann May Kelly was born and raised in New Jersey where her passion for the arts started at a young age. 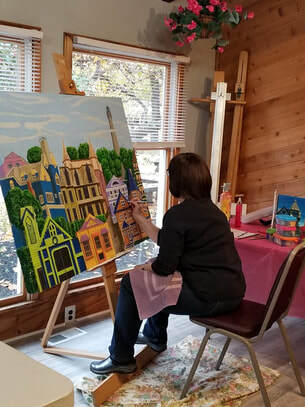 After excelling in art in high school she continued on to the Moore College of Art and Design where she earned a BFA and later her teaching credentials. She also studied at the Pennsylvania Academy of Fine Art sand at Studio Incamminati. She presently teaches at art centers in Haddonfield, Marlton, and Medford alongside her continued practice.